At first, news of the impending closure of the county’s only Community Health Center facility, in Morro Bay, sent ripples through the city’s low-income patients who rely on its convenient location. A few of those patients even took their concerns to the City Council, pleading for an effort to keep the center local, worried about how they were going to get the care they depended on without proper transportation. “It is so obviously a very necessary part of our community, I didn’t really need to hear about it. I just knew it was going to be a concern when I heard about the move,” Councilman Noah Smukler told New Times. The move went ahead as planned on Jan. 3, when the Morro Bay location shut its doors; the staff and medical equipment packed up and shipped south to CHC’s “super center” on Casa Street in San Luis Obispo. But the sky didn’t fall for those patients. While getting from Morro Bay to SLO may prove an undesired extra hoop to jump through, CHC staff—and a few members of the Morro Bay community—have stepped up to make the burden as light as possible. The old facility, which opened in 2004 under a county contract, had four employees, including Certified Physicians Assistant Eric Hixon. Those employees all kept their jobs and have moved to the new location. 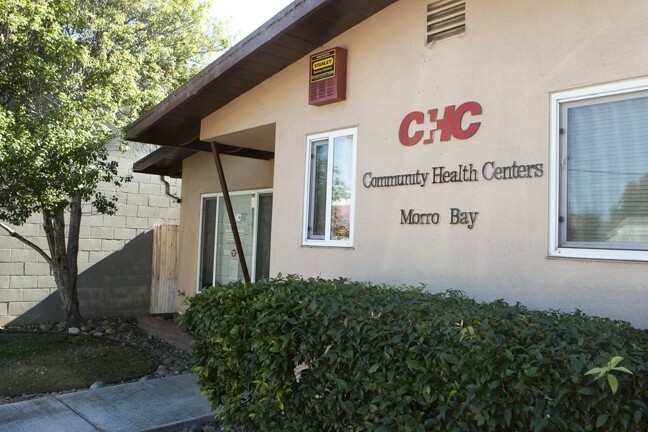 OLD AND NEW: The former Morro Bay Community Health Center facility is no more, but its merger with the CHC Supercenter in SLO promises to better serve the former location’s clients with help from the county and members of the community. The same primary care and pediatrics services are available at the new location (77 Casa St.) Monday through Friday, 8 a.m. to 7 p.m., and Saturday from 9 a.m. to 5 p.m.
All patient records automatically transferred. The primary reason for the move, according to CHC CEO Ron Castle, is to reallocate resources from smaller locations and apply those to the development of “super centers,” which are supposed to increase access and capacity for the influx of new users who will take up CHC’s services through the Affordable Care Act. These centers currently exist in SLO, Paso Robles, Arroyo Grande, Nipomo, Santa Maria, and Lompoc. The idea is that, eventually, these super centers will be open 12 hours a day, seven days a week. Another factor in the merge is the expiration of the county’s contract with CHC; funding has dwindled from $5.4 million in 2004 to just $2.5 million for services in 2013. As of Jan. 1, that contract has been discontinued. During the same time, CHC’s patient population has doubled from 40,000 to more than 90,000 across the network—and is expected to expand further. The physical building of the Morro Bay facility was a concern as well. According to Castle, it wasn’t conducive to expanded access or increased patient capacity. Due to its small size and lack of exam space, staff had concerns with privacy. Community Health Centers Chief of Operations Officer Denise Stewart has been in contact with Dr. John Headding, a pharmacist with Morro Bay Drug and Gift at 600 Morro Bay Blvd., who has offered to act as an “information access point” for his customers and anyone with questions. “While CHC has no formal association with Dr. Headding or Morro Bay Drug and Gift, we are grateful for his advocacy and concern for the health care needs of all Morro Bay residents,” Castle wrote to New Times. On Jan. 14, CHC Spokesman Steve Mahr finalized these facts before the Morro Bay City Council as well as the Estero Bay Alliance of Care, in order to get the word out. Anybody with questions is invited to contact the CHC toll free information line at 1-866-614-4636, or Headding at 771-9988. For free transportation arrangements, call 1-877-743-3242 and ask for Transportation Coordinator Patty Starr. Former News Editor Matt Fountain can no longer be reached at mfountain@newtimesslo.com. Send comments to the executive editor at rmiller@newtimesslo.com.